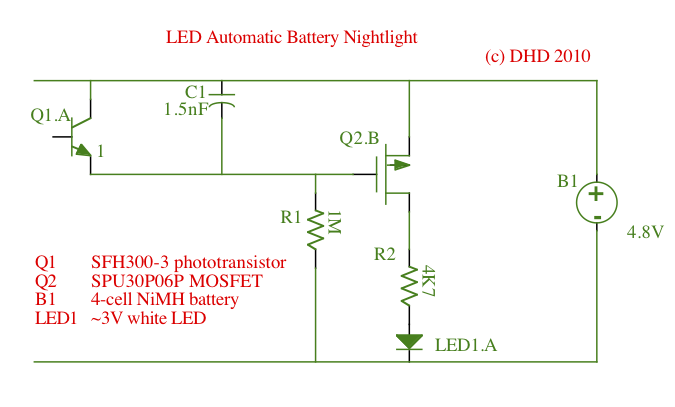 How to light the landing at night, with a partly self-recharging LED-based automatic nightlight: what could be better? We decided that it might help our daughter find her way to the loo in the night (late 2010) to try a nightlight there. And help us to get around at night without turning on the main overhead light on our upstairs landing, possibly disturbing both children. Here's how I brewed my own, still going strong in 2019. The upstairs corridor does not have even one power socket, so my first attempt was to try using a 3W (cool white) MR16 12V lamp from my solar off-grid system, temporarily hooked up at the master bedroom door. It's certainly enough to see by, even downstairs, but was too bright and kept us awake at night. Also the power drain is a bit more than I'd like from my off-grid system (the 'official' server drain is under 4W!). My second attempt involves a block of 4xAA NiMH 1.2V rechargable cells, a 470Ω resistor and a push-button toggle switch, and a 10mm nominal 60cd (60kmcd) 3.5V white clear LED c/o Thurmond M in Texas (thanks again) that I had available to tinker with, all in series in a clear plastic box, sitting on a chest of drawers. So far so good. Circuit diagram/schematic as: .SHX, .pdf, .png. With the 4.7kΩ resistor (up from an initial 470Ω which made the nightlight too bright) the current draw is ~0.4mA with fully-charged cells, this ~1mW total draw from the battery of ~10Wh capacity, (much less than 1000th of my previous solution!) thus nominally good for the entire winter at 10 hours per day before recharge, though self-discharge from the batteries is probably higher. The resistor value can be reduced to 100Ω or thereabouts to increase brightness at the cost of reduced battery life. The small capacitor is to suppress any tendency to oscillate. Steve C wrote to tell me about the motion-triggered Philips SpotOn LED that uses AAA batteries (ie that could be rechargable) "We've got 3 of them at floor level and they work very well, particularly with the motion sensing mechanism meaning they only switch on when they detect your presence and then switch off 30 seconds later." 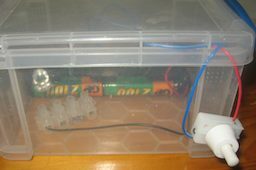 Update 2011/09/22: I couldn't resist the urge to tinker, and given that the batteries have lasted 6 months or more in summer, I want to see if I can make the night-light completely free-standing, scavenging the small amount of light energy where it is. To this end I have bought (from Active Robots Ltd) a small PV panel, nominal 6V/200mW, Voc~8V, 37mmx66mm polycrystaline (part SCC3766-MSE). 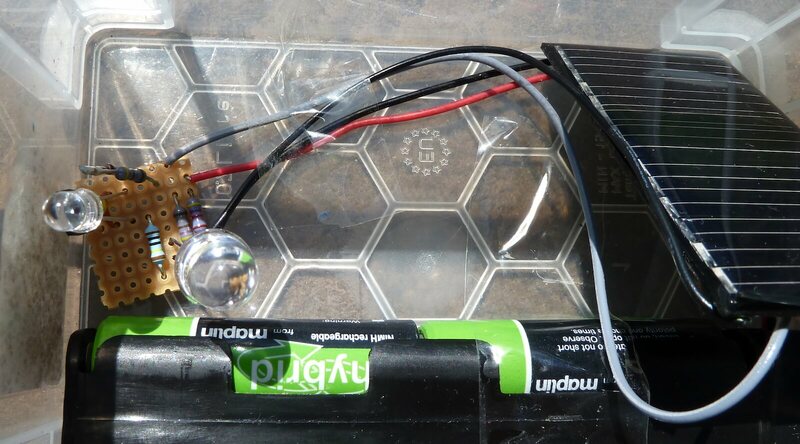 I shall connect it to the batteries via a diode and a 470&ohm; resistor (to limit maximum charge current in bright sunlight to about 6mA or a 0.0033C trickle charge limit as suggested on Wikipedia). Inside, even mid-day, I cannot expect energy capture above ~1% of nominal, so in particular I'll use a low-leakage diode to minimise drain from the battery back to the panel. Given a lamp draw ~1mW and the PV output possibly similar for maybe 8h/day each, with the PV output improved if we can pop the box on a window-ledge when the light gets too dim at night, this might just work, else I can upgrade to the relatively-huge 1W PV! Update 2011/09/25: as a further cheat/enhancement I'm swapping the ordinary NiHM cells for 'hybrid' versions of similar capacity that should have lower leakage, ie self-discharge, and thus eke out some extra life in winter. The new cells are 2100mAh nominal compared to the 2500mAh of the previous ones. Update 2011/10/17: Voc of the solar cell/PV in the sort of lighting I'm anticipating is ~2.5V compared to the battery still over 5V, so to get any useful charging I suspect that I'll have to buy a second panel and put it in series. Update 2012/02/10: Battery still reading 5.00V! Update 2012/06/12: when I notice direct sunshine falling on come convenient surface, eg in one of the bedrooms, I put the nightlight there to help it charge. Still no manual charge has been required since December (ie 6 months so far). Update 2012/09/25: battery voltage down to ~4.2V in spite of occasionally being put in full sun (inside, eg on a window-ledge) to charge a little, tested because the light seemed a little on the dim side last night, so batteries being given a manual (fast) charge from off-grid solar PV. ~2h recharging every 9 months is not too bad, but I may used a bigger internal solar panel to make the nightlight nearer self-sufficient. Update 2013/06/24: battery reading 2.84V (!) though still glimmering faintly at night; getting recharged from off-grid solar system today. Update 2013/11/19: snuck in battery recharge from off-grid solar system today, as was sunny. Update 2014/08/29: battery reading 3.48V, so recharging from off-grid system while light outside! My fast charger seems a little fierce and the battery is reading over 9V after. Update 2015/07/21: fast (<1h I think) charge from off-grid supply as light very dim. One cell finished charging well before the others, so may be failing. Update 2016/09/14: (battery voltage 3.22V) fast (<1h I think) charge from off-grid supply as light very dim. Charger initially drawing ~16W for the 4xAA NiMH hybrids. One cell finished charging well before the others, so has been swapped out for another cell of exactly the same type (ie Maplin NiMH hybrid 2100mAh). Hot out of the fast charger at 5.56V, balanced 2.78V between each pair. Update 2017/05/20: (battery voltage 3.45V) fast charge from off-grid supply as light very dim. Charger initially drawing ~18W for the 4xAA NiMH hybrids. 5.6V after charge. Update 2018/02/28: fast charge from off-grid supply as light very dim. Update 2019/01/22: fast charge from off-grid supply as light very dim. Don Klipstein's Brightest and Most Efficient LEDs page. First published 2012-06-12 , updated 2019-04-18 , rebuilt 2019-04-19 . Site copyright © 2007-2019 Damon Hart-Davis. Hosted by ExNet.